Okay, it was 1953 and the 'old bus' was likely a converted war surplus workhorse, but that was mother's experience on her honeymoon on a Bond's Tours excursion to the Flinders Ranges 65 years ago. The original 'chalet' wasn't much chop either apparently. So when I told her we would be 'camping' in Wilpena Pound in winter, she recoiled in horror, but softened considerably when (after an effortless, all-tarmac drive) she saw the fancy new “glamping” option available since 2014 at the Ikara Safari Camp, a secluded enclave at the furthest point of the expansive campground typically filled with expensive caravans and mobile homes. 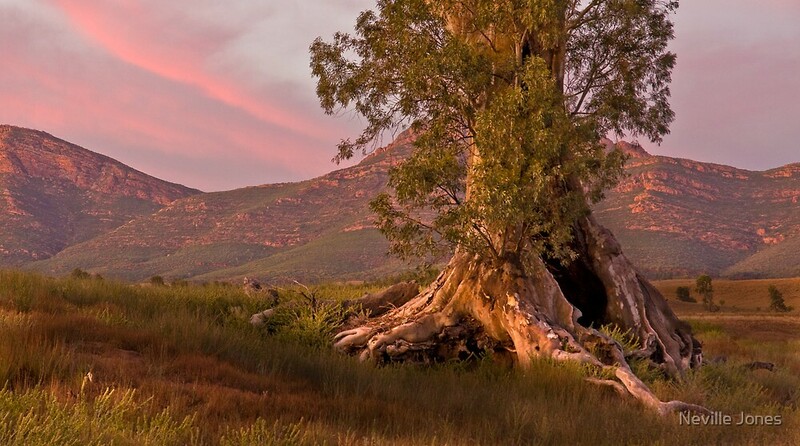 Despite relatively inauspicious beginnings, Wilpena Pound in South Australia's Flinders Ranges is now justifiably ranked as one of Australia's most scenic locations and an increasingly popular destination for both domestic and international visitors. 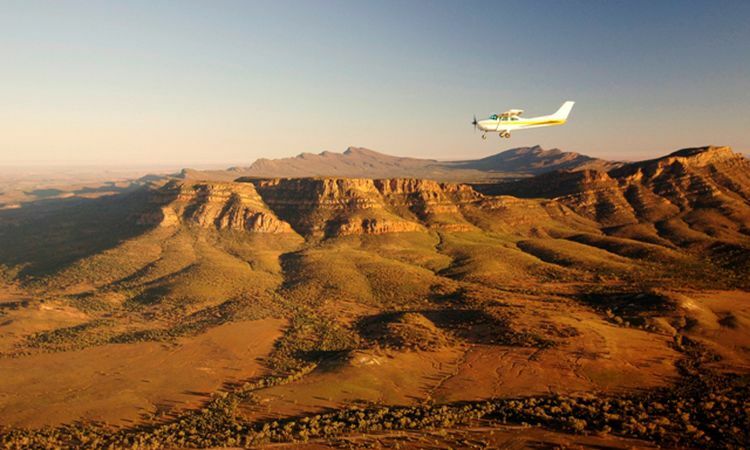 Guests can even fly in from Adelaide and get a scenic flight included. Since my last visit in 2010, the resort has changed hands and is now majority owned by the traditional owners, the Adnyamathanha people, who provide much of the staff and guides operating tours and sightseeing activities with both indigenous and European history a feature. 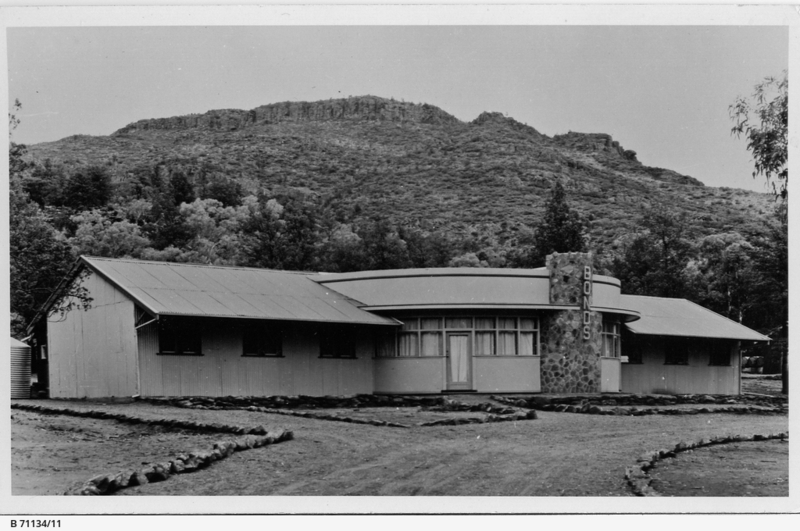 Ironically, the much of the attraction of Wilpena Pound came about thanks to early European pastoralism when the region was exploited for sheep and cattle. The scenic beauty attracted photographers and artists from far and wide. Works by painters Hans Heysen, Ronald Coudrey, Gary Gaston, Terry Lewistka and Margaret Lang are now famous at least in part because of their setting in the glorious Flinders Ranges. While modern landscape photographers rejoice in these vivid surrounds, it was NZ-born Harold Cazneaux’s magnificent River Red Gum which won first prize at an International Photographic Exhibition in 1937, that brought Wilpena Pound to a global audience. This spurred tourism, particularly in the postwar period thanks to the likes of Bert Bond and his funny old trucks and ‘rustic’ chalet. The ebullient Kevin Rasheed took over in 1958 and lifted the standard continually until his death in 1992. His son continued to run the resort until 2008. It’s been relatively recently that the indigenous significance has formed part of the attraction. Mum would never have had an indigenous guide in 1953, they were busy working as stockmen or domestic hands. That’s all changed and now Ringo, Jimmy and Uncle Andrew spearhead the ranger team while the women keep the camp. 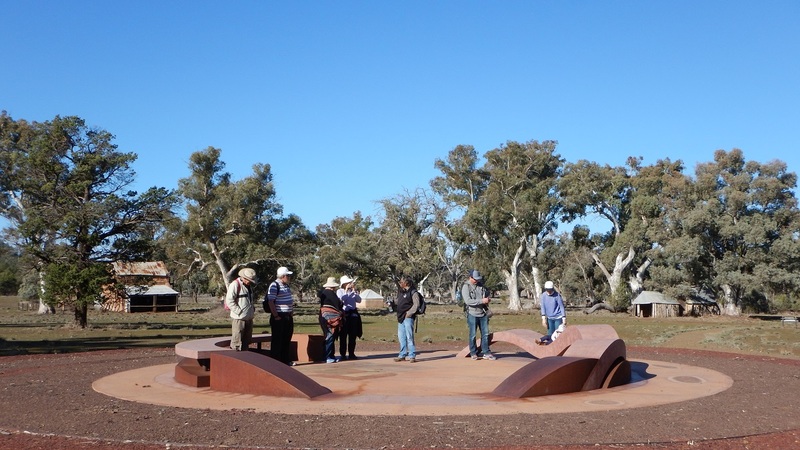 "Wilpena Pound is a very sacred and significant part of the world...and there are an enormous amount of art galleries and so forth around the place, a lot of living archaeological significance. It certainly is a very special place to the Adnyamathanha people," said Vince Coulthard, the chair of the Adnyamathanha Land Association, in an ABC Radio interview. After a 'welcome to country' fireside chat with Ringo, the rainbow serpent blessed us with superb weather. We jumped aboard the resort’s shuttle bus out to the original Hill family homestead, then walked with Uncle Andrew to the old Wilpena station for a look at the original buildings and a 101 in the Adnyamathanha people’s oral history. A fitting monument has been built around which to share these stories, called Ikara (or ‘meeting place’) not all of them a happy remembrance, but told without judgment or malice nonetheless. The evening event is Jimmy’s sunset drive to Stokes Hill lookout where a 3D model of the pound gives you some idea of the grandeur of the geology, which is not a dormant volcano or meteor crater as some once thought, but sedimentary rock in the form of a large syncline (folded rock layers). Jimmy tells us this as well as the names and uses of many local bush herbs his people have used for thousands of years like arta (yacca), Nguri (wattle trees), native orange (iga) and native pear (maiaka). As the sun goes down, washing the rolling hills and steep escarpments with soft pastel hues of lilac and gold, it’s time to remember that our fleeting visit is just a tick of the geological clock. The rainbow serpent of Jimmy’s Dreamtime has long moved on, leaving him and the Adnyamathanha people to watch over its creation. Until next time. 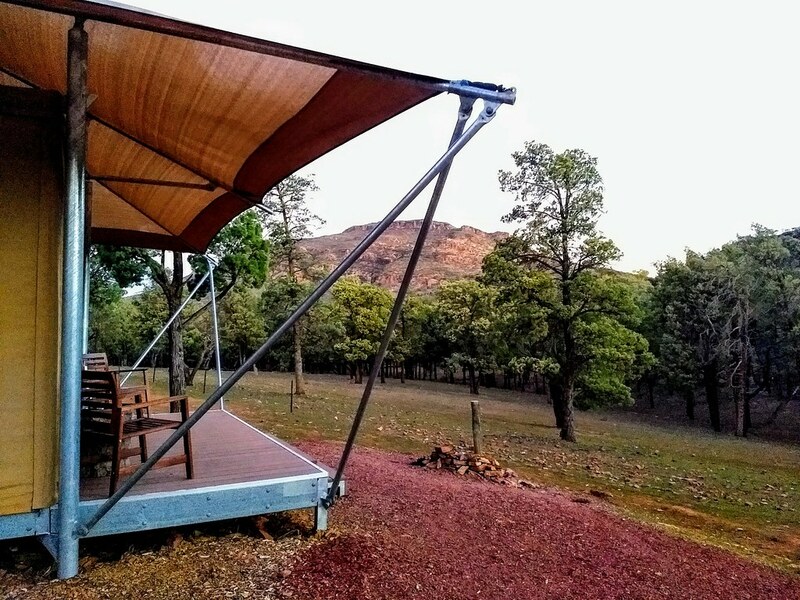 The Ikara Safari Camp comprises 15 ensuite safari tents set among imperious river red gums and native pines with the tents facing out onto a distant escarpment which glows impressively in the winter dawn light. Each tent is a usable 24sqm and made from insulated canvas with reverse air conditioning to cope with the extremes of outback temperatures. Inside you we find quality king beds and linens, side tables and lamps, luggage storage, a mini fridge, in-room safe as well as tea and coffee making facilities.